What do eight FIU students studying various majors — including hospitality and tourism, biomedical engineering, women’s and gender/queer studies and medicine — have in common? All — Pamela Lopez, Bobbi Sade, Charisse Mellison, Alyssa Pepio, Chelsea Cosner, Carter Casio, Kelly Rojas and Cathy Ng — received scholarships from the Aqua Foundation for Women (AFW), an organization committed to supporting the wellness and equality of members of the lesbian, bisexual and transgender community in South Florida. In addition to the monetary award, each scholarship recipient is paired with a mentor to provide support with her education, personal development and community goals. “These scholarships were given to promising young LBT women who were selected due to their outstanding academics, consistent commitment to the community and their leadership potential,” says Gisela Vega, AFW Scholarship committee chair and associate director of Multicultural Programs & Services, LGBTQA Initiatives at FIU. This year’s individual awards ranged from $5,000 to $7,000 and aimed to assist LBT women grow personally and professionally through financial assistance. As for what it’s like to share the unique distinction with so many other fellow FIU students. 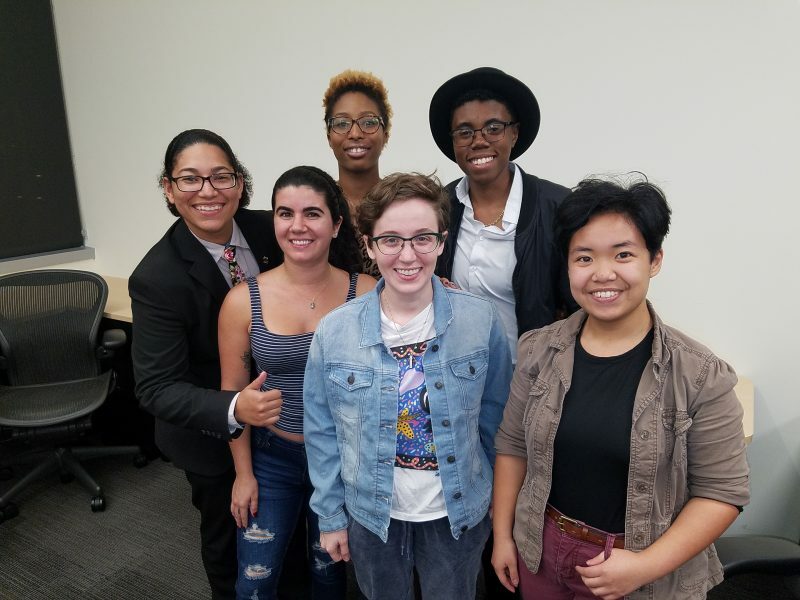 “It makes me so happy to know that my fellow peers are just as passionate about being young LGBTQA leaders as much as I am and that we share a university together,” says award recipient Casio. “With the help of Aqua Foundation, [we] are well on [our] way to creating real change in our community, and the world as a whole,” adds Mellison. 2018 Aqua Foundation for Women Scholars: (Back row) Pamela Lopez, Bobbi Sade, and Charisse Mellison (Front row) Alyssa Pepio, Chelsea Cosner, Carter Casio. Not photographed: Kelly Rojas and Cathy Ng. For information on LGBTQA initiatives and opportunities available at FIU, please visit the Office of Multicultural Programs and Services (MPAS) or email lgbt@fiu.edu. The mission of the MPAS LGBTQA initiatives is to meet the needs of the LGBTQA student population, by developing and implementing educational, social, and resource programs and services. These initiatives are aimed at reducing homophobia and heterosexism on FIU campuses through education, advocacy, awareness and assisting LGBTQ students in reaching their full potential.